A ship called the Ravenscrag arrives in Honolulu harbor bringing with it the Portuguese instrument known as the braguinha, which is an immediate hit with the Hawaiians. The islanders rename it ukulele (pronounced oo-koo-le-le in Hawaii), meaning "jumping (or leaping) flea." While there are many stories about how the ukulele got its name, the most literal is that a good player's fingers skipping about on the fret board resemble a "jumping flea." 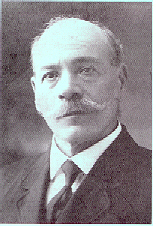 One of the passengers on board the Ravenscrag, Manuel Nunes (1843-1922), plays a major role in transforming the braguinha into the Hawaiian ukulele. 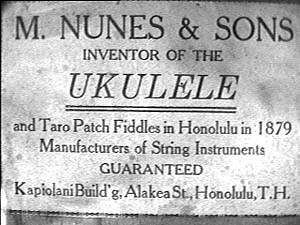 A photograph of Manuel Nunes, and an interior label from one of his ukuleles. Along with some of the other great Hawaiian ukulele makers--Dias, Santo and later Kumalae and Kamaka--Manuel Nunes discovers that the wood from the local Hawaiian Koa trees is exceptionally light and resonant for good ukulele making. Indeed, the most common and most revered wood traditionally used by Hawaiians to build ukes is from the beautiful and plentiful Koa tree. The early instrument builders learn that Koa ukuleles sound great, and as they age they sound even better. 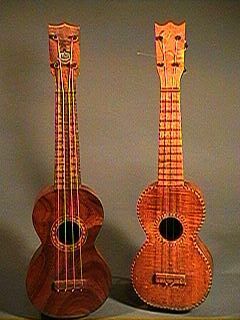 A photograph of two early Nunes Koa wood ukuleles. 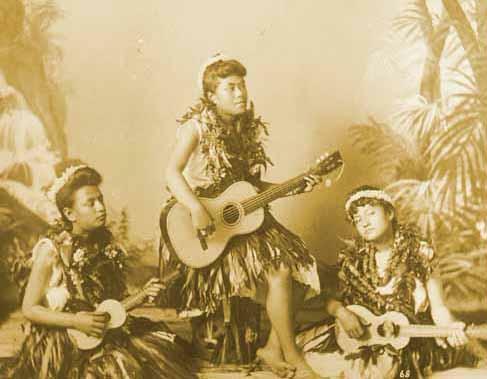 Three native Hawaiian women, playing Uke, taropatch, and guitar in 1892. 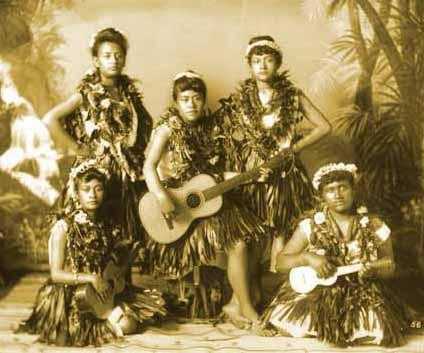 The same women and instrumentation, this time with two Hula dancers, also in 1892. 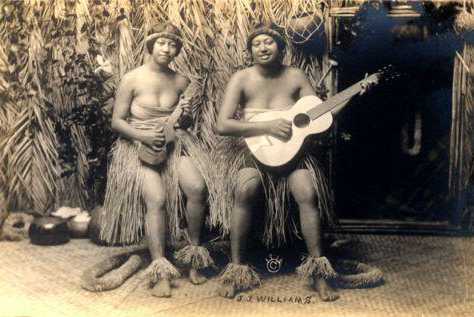 Two native Hawaiian women, playing a Uke and a guitar (date unknown). "What a mine of wealth these magnificent Koa trees would be to the people who should transport their timber to the shore and ship it to foreign countries! 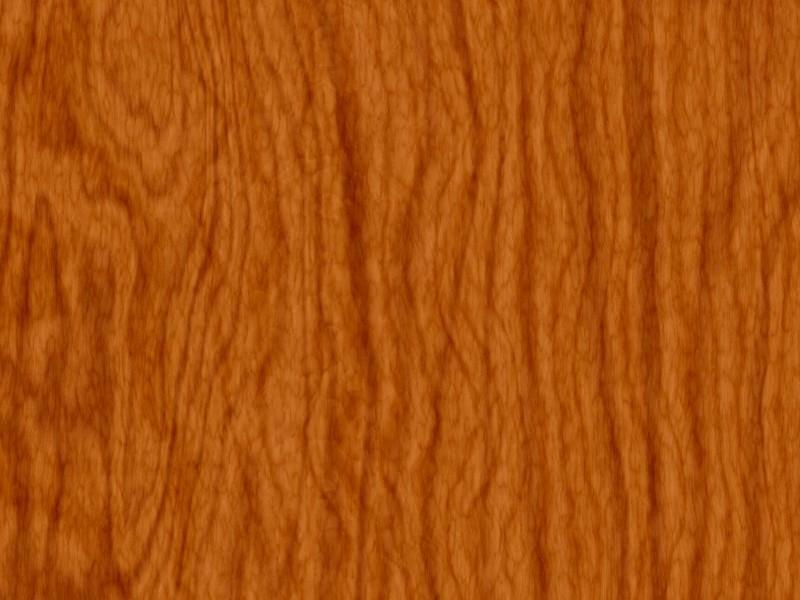 The Koa is the Hawaiian Mahogany. It takes a polish like gold or diamonds. In the hands of foreign workmen, it might be made as ornamental as precious marble. And here is a great belt of it around Hawaii, broad and full enough to supply every city in America. These commercial estimates are all afterthoughts. While under the fascination of the lavish beauty of the woods, no sense is appealed to but the aesthetic." Koa is unique to Hawaii, and grows nowhere else on planet Earth. 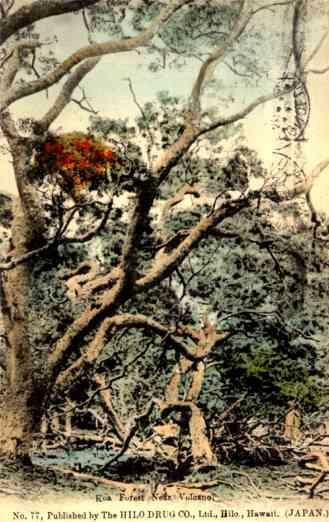 A 1908 postcard showing a Koa forest near a volcano.